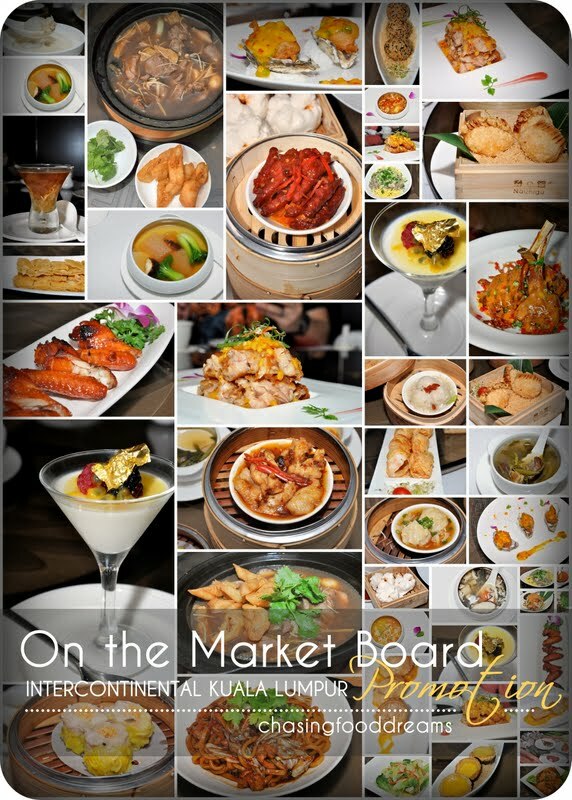 Tao Cuisine, Intercontinental Kuala Lumpur: On the Market Board Promotion! All You Can Eat Tao’s Dishes for One Price! Have you heard about the latest promotion in town? Tao Cuisine at Intercontinental Kuala Lumpur is bringing some live actions to the restaurant! For the month of May, Tao Cuisine is featuring a sumptuous ‘On the Market Board’ promotion where diners pay one price to enjoy a delectable list of dishes by Chef Wong Lian You and the kitchen team. The promotion is only available for lunch and dinner during weekends and public holidays. A class on its own, Tao Cuisine showcases exquisite fine-dining Chinese cuisine that merges with little twists of Western influence. The restaurant ambience is set for an unforgettable fine dining experience with lots of modern contemporary design mingling with Chinese inspirations. Enjoy private dining experience in their many private rooms or savor the full elegance of their restaurant beneath the glittery contemporary designer lights. On the Market Board promotion features the freshest catch of the day and organic greens available on the market cart. A list of unlimited offering of Dim Sums, Soups, Main Course, Rice & Noodles and Desserts offer diners a wide selection of dishes. In addition to the list of dishes available, select the daily ingredients available and have Chef Wong whip up a feast for your enjoyment! 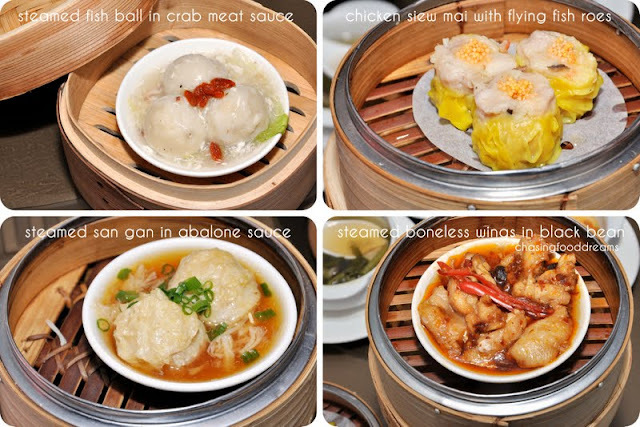 Dim sum connoisseurs will be pleased with the selection of mouth-watering morsels. It is indeed a lovely way to kick start the meal with an assorted range of snacks and buns. I was particularly impressed with the Chicken Siew Mai for its juicy and bouncy texture while the Steamed Boneless Chicken Wings with Spicy Black Bean Sauce is simply addictive. Another delectable dim sum of Deep Fried Prawn Dumplings with Wasabi Mayonnaise and Fried Crispy Bean Curd Rolls with Prawns and Cheddar Cheese was well executed to a tee! More dim sum awaits from fluffy traditional BBQ Chicken Buns, Steamed Marinated Chicken Feet with Three Varieties Sauce and Wok Fried Radish Cake with Supreme Chili Sauce. Since Tao Cuisine is pork free, I am impressed with the dim sum as the textures and flavors are really beautifully executed using chicken and seafood. With six choices of soups available, the menu is obviously well thought off to cater to the diners. There is a daily soup of the day together with classics and nutritious broth to nurture one’s appetite before the main courses. The other five choices of soups are Braised Hot and Sour Soup served with Wantan, Braised Enoki Mushrooms, Crabmeat and Diced Tomato in Sweet Corn Broth, Double-Boiled Sea Cucumber with Cordyceps Flower and Wolfberry Soup, Boiled Fish Ball with Seaweed Soup and Double-Boiled Shitake and Bai Lin Mushroom with Vegetable Soup. My personal favorites are the Braised Hot and Sour Soup served with Wantan for its intense sour and spicy notes and Crabmeat and Diced Tomato in Sweet Corn Broth for its gentle and sweet flavors. Double-Boiled Sea Cucumber with Cordyceps Flower and Wolfberry Soup will also warm the hearts of many with its nutritious value so be sure to savor this! Main course is endless! Choose from some of the main course listed in the menu like Deep Fried Marinated Chicken Wings with Oolong Tea Leaf, Deep Fried Chicken Fillet with Pineapple in Sweet and Sour Sauce, Slow Cooked Beef with Yam, Assorted Seafood Stew, Poached Lamb Fillet in Bak Kut Teh Style and more. The Poached Lamb Fillet in Bak Kut Teh Style is unique and the herbal broth is really nicely balance with sweetness and lots of herb flavors. Chef Wong and team offers a wide range of preparation for daily ingredients featured on the market cart. Just choose your choice of seafood, meat and organic vegetables and mushrooms and Chef Wong will recommend methods of preparation to cater to your fancy. There will even be some live actions going on nearby by the kitchen team! That evening, we savored sumptuous Deep Fried Oysters with Mango Puree, Barbeque Chicken Wings, Lamb Rack in Mongolian Sauce, Crispy Chicken in Fruit Salsa and a very unique Yau Mak with Salted Fish and Citrus Sauce. The oysters were exceptionally crispy and soft all-in-one and laced with a sweet creamy mango puree. Interesting combination and the flavors of the oysters paired really well with the sweet puree. Another crowd favorite that night was the tender juicy lamb rack dressed in a spicy piquant Mongolian sauce. It was so good, we made sure to clean up the rib and juices. The chicken wings are also well marinated, oozing with a smoky fragrant aroma while the vegetable with the salty citrus sauce is truly a delicious surprise on the taste bud. Be adventurous and ask for the restaurant’s specialty for your ingredient of choice! Though choices are limited here, diners certainly won’t mind as there are plenty of other dishes to fill one up! Fried Fragrant Diced Chicken Meat Rice with Black Sesame Powder, Braised Japanese Udon Noodles with Chicken Meat in Hokkien Style and Stir-Fried Flat Noodles with Beef Slices and Bean Sprout is simply present to those who really cannot do without the basic staple of rice and noodles. Another list of 6 desserts to end the gastro journey with offerings like Slow Boiled Snow Fungus with Sea Coconut and Ginseng Roots, Creamy Milk Pudding Served with Passion Fruit Dressing, Poached Black Sesame Glutinous Dumplings in Warm Soya Bean, Chinese Pancake with Lotus Paste, Deep Fried Glutinous Sesame Balls with Bamboo Charcoal Lotus Paste and Oven Baked Mini Fragrant Egg Tart. Desserts are a hard decision as all six has its own flavors of goodness, so make sure to save room to try them all if you can! On the Market Board promotion at Tao Cuisine is a great choice for some fine-dining experience to savor a variety of dishes at one price. Coupled with the gorgeous ambience, it’s perfect when one feels like splurging on some fine dining experience. For now, the promotion is available through the month of May till further advice. RM98++ per person for unlimited offerings from On the Market Board Promotion menu and market cart. Applicable only on Saturdays, Sundays and Public Holidays for lunch and dinner. *Term & Condition applies. Diggin the Awesome Crabs Here! This was consumed a few months back with my family when cravings for crab hit us. My sister who lives in Kota Kemuning recommended this place to us for crabs since she had dined here few times and enjoyed them here. Since we had our sister visiting from overseas, we thought she would love a good crab night out. Ah Lim Seafood, owned by two Lim brothers from Perak, serves up a nice range of home cook dishes with focus on seafood. We were late that evening for dinner and were glad that only few tables were occupied. With dishes logged in, it sure didn’t take much time for the dishes to arrive. The seven gluttons ordered 8 dishes plus side orders of fried mantao. The restaurant is open air and since the night was cool, we didn’t mind camping out on the open area of the restaurant. Décor is minimal with the classic plastic furniture and red tablecloths. This rice noodle was decent but nothing to shout about. It had a good amount of ingredients and the egg gravy was average. We love the fluffy fried rice studded with lots of Chinese sausage, small prawns, long beans and egg. Well-seasoned with nice separated grains, the rice was quite moist and very aromatic from the wok heat! A plate of sautéed vegetables to provide some greens for our tummies before stuffing them silly with seafood! I loved this for its warm comfort flavors. Two huge cuts of garoupa deep fried to crisp with soft sweet flaky flesh are drenched in a pool of sweet and sour sauce. Sweet and sour sauce may be common everywhere but getting the good balance of sweetness and sourness is only achieved by few. It is almost perfected here and the sauce gets some extra sidekicks of shredded onion, bell peppers, tomatoes and chilies. We literally scraped the plate for all the delicious sauce to coat our rice… pure bliss! We purposely asked for large crustaceans and the owner obliged which of course came with a heftier price tag. Malaysia has so much ways of cooking crab that sometimes choices are difficult. That evening, we didn’t feel adventurous so we settled for letting the crustacean shine in its own flavors. Baked or grilled, the crab was lightly salty from the seasoning on the shells but the flesh was deliriously sweet! It also has a nice smoky salt aroma from the baked method. We were extremely happy with this as sometimes going back to originality work wonders for the soul. When this was placed in front of us, everyone told me that I better snap this fast because they are going to diggin regardless of my lens! Basking in full glory of deep orange egg sauce, the Spicy & Sour crab is just begging for attention. We really worshipped the dish to all its ingredients and clean out the awesome spicy and tangy sauce. Even with the heavy robust sauce, we can also taste the sweet flesh of the crab, sucking every little bit down to its skinny legs. I probably could ramble on about how awesome this dish is but I think I will let the photos do its magic. So Shiok!!! This was a no-brainer since we need this to mop up all the glorious sauce. I think we doubled up this order because we didn’t want to waste the crab sauce!! Ah Lim Seafood sure serves up really good classic Chinese food. The seafood is really fresh that night and every seafood dish really rocks in their own flavors. There are just days when you want pure honest-to-goodness food, no ambience or anything else needed. Ah Lim Seafood fits the bill for churning out great classics. Going back to simplicity rocks! Don’t have the prices because sista paid! Love my sisters lah….